It has been another busy year for legislators in the United Arab Emirates (‘UAE’), as there has been a number of changes to the regulatory framework in the financial services sector. This article looks back on some key financial services’ legal and regulatory developments in 2018 and early 2019. After nearly 40 years, the law which underpins the UAE Central Bank (‘CB’) and the banking industry in the UAE has been replaced. The 1980 Union Law has been repealed and replaced by Federal Law No 14 of 2018 regarding the Central Bank and Organization of Financial Institutions and Activities (‘Banking Law’). The CB regulations currently in place shall remain in full force and effect until new regulations are issued by the CB. The new Banking Law does not apply to the financial free zones (the Dubai International Financial Centre (‘DIFC’) and the Abu Dhabi Global Market (‘ADGM’)). The Banking Law strengthens the CB’s ability to exercise effective regulatory control over the financial sector in line with international best practices and standards. The finance lease law which was approved by the UAE’s National Council in 2018 is now in force having been published in the Official Gazette. The law will be supplemented by a set of implementing regulations applicable to the licensing of finance lease activities in the UAE. The law mandates that the CB regulate lease financing and accordingly the CB shall issue its regulations to licence finance lease activities within the UAE. The new Anti-Money Laundering (‘AML’) law was issued on 30 October 2018 and has introduced more enhancements to the processes already in place for combating money-laundering crimes. 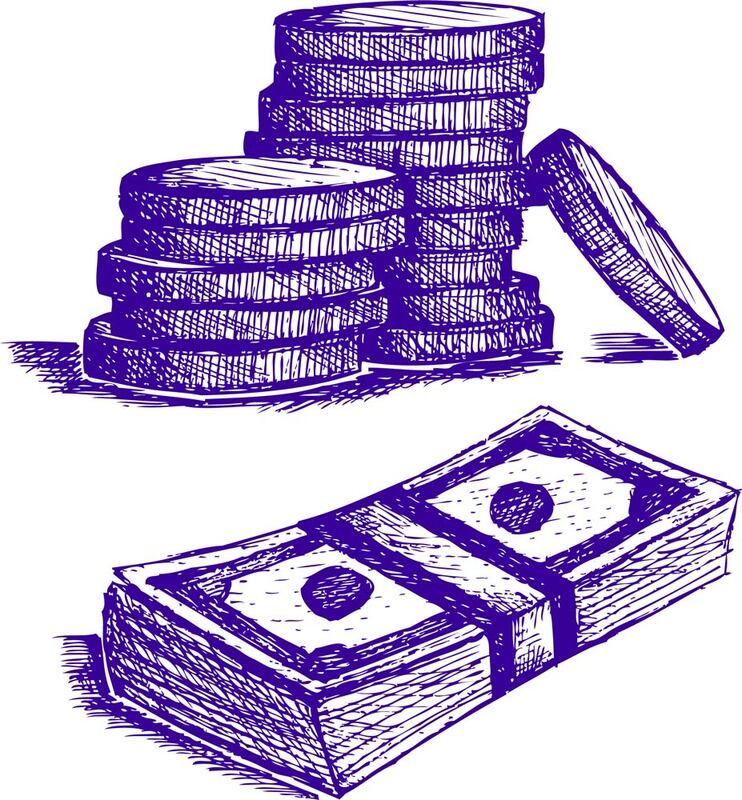 These include additional enhanced investigation procedures (including the ability to permit a transaction in order to trace the funds and take action), increased fines and penalties, as well as establishing the process for freezing funds associated with financial crime. 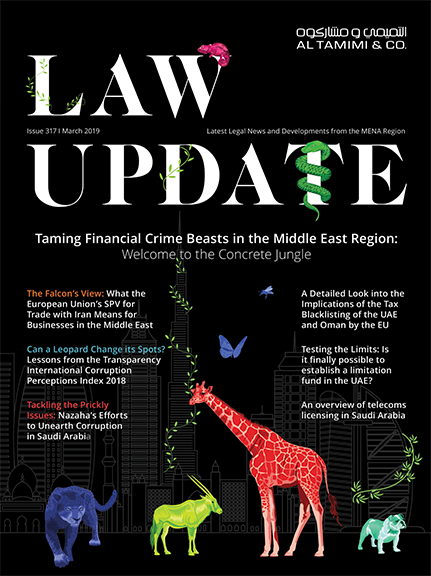 As highlighted in the Financial Free Zones section of this Article below, the UAE has been working to enhance its existing AML regime, so it aligns with the 2012 Financial Action Task Force (‘FATF’) Recommendations. In this circular the CB has set out the maximum caps on fees and charges which can be levied by banks. All fees set out in the circular are exclusive of UAE VAT charges. It appears from the provisions of the circular that banks can charge VAT on top of the maximum caps on the fees set out in the circular. This is unlike the previous position of the CB in an earlier circular in 2017 in which it instructed the UAE banks not to levy VAT on fees and charges and to absorb the tax amounts until receipt of further instructions from the CB. For many years banks have been enquiring about the position of dormant accounts held by UAE banks. On 24 April 2018, the CB announced the Dormant Accounts Regulation pursuant to Circular No. 10 of 2018. This regulation explains the handling of dormant accounts and unclaimed balances; and sets out a framework for the control of dormant accounts; and procedures for enabling available balances of those accounts to be received by customers. These regulations, issued in April 2018, replace the previous finance company regulations issued in 1996 and finance companies regulations for companies conducting business in accordance with Islamic sharia’a principles issued in 2004. These new regulations encompass Islamic and conventional finance companies and introduce significant regulatory changes to the regulatory requirements applicable to finance companies (including capital requirements) and set out the type of activities permitted to be carried out by a finance company in the UAE. The Netting Law was issued on 20 September 2018 regulating netting for the first time in the UAE and it follows the guidelines of the International Swaps and Derivatives Association (‘ISDA’) Model Netting Act 2006. The new Banking Law has also recognised netting, which is a significant legal development for the users of derivative contracts in the UAE. The provisions of the Netting Law may overrule the concept of gharar, which is prohibited under the UAE Civil Code. The law permits the Federal Government to issue sovereign debt for the first time in the UAE. The Public Debt Law allows for establishing markets for government debt instruments through which those instruments can be traded in UAE markets, and hence become a source of funding for government projects. The law is a significant step in the development of the UAE’s debt capital market. It will also support the CB to manage the banking liquidity. The Regulation of Derivatives Contracts: Chairman of the Securities and Commodities Authority Board of Directors’ Decision No. (22/R.M) of 2018. The UAE Securities and Commodities Authority (‘SCA’) has issued regulations concerning certain types of derivative contracts for the first time. However, the scope and types of contracts that will be regulated remains unclear, as the SCA has not currently provided any separate guidance to clarify. It prima facie appears that the intention is to regulate: (i) contracts listed and traded on the local exchanges in the UAE; and (ii) contracts where the underlying investments are securities listed on UAE markets. Parties to derivatives contracts had until 30 January 2019 to adjust their positions to accord with the regulation in order to avoid any adverse impact on existing contracts. These derivative regulations are newly issued and the position would need to be monitored and considered once the SCA has issued further guidance. The SCA has issued regulations in connection with its FinTech regulatory sandbox. A sandbox is defined in the regulations as a process-based framework that allows entities to test innovative products, services, solutions and business model under relaxed regulatory environment, but within a defined space and duration. Since the concept of regulatory sandbox has become widely spread across the financial services sector, the SCA has taken the initiative to promote innovation by developing its regulatory framework. These regulations aim to regulate the central depository activity in the UAE and the licensing requirements for depositary centres in the Emirates. This decision relates to the issuance or offering of any Shari’a compliant securities in the UAE (including by foreign entities) or outside the UAE by UAE based issuers. The decision imposes various obligations in relation to such offers. Pursuant to these regulations, the SCA is now regulating credit rating agencies in the UAE. A credit rating agency may only be carried out in the UAE subject to obtaining a licence from the SCA. 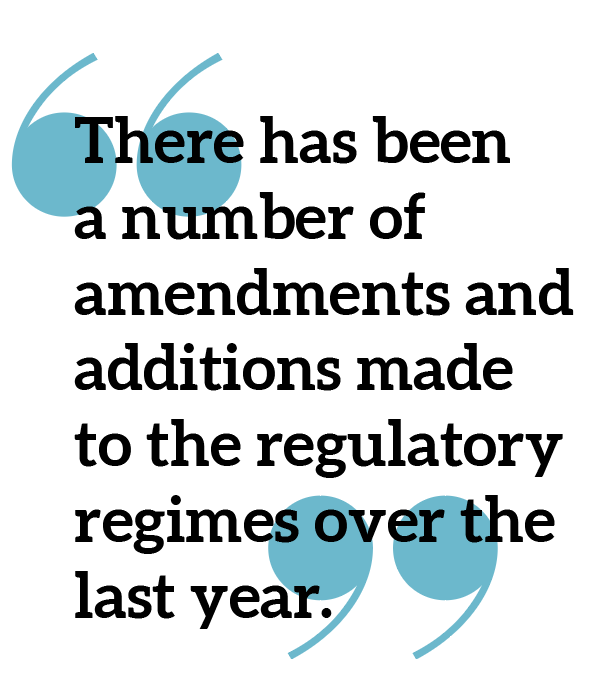 In the DIFC and the ADGM there has been a number of amendments and additions made to the regulatory regimes over the last year. By way of summary we have highlighted below only some of the more significant updates. In November 2018, the SCA, the Dubai Financial Services Authority (‘DFSA’) and the Financial Services Regulatory Authority (‘FSRA’) agreed on a common legislative framework which allows domestic funds, to be promoted anywhere in the UAE, in line with agreed provisions and licensing regulations. Each regulator will establish a notification and registration facility which will allow for the promotion of domestic funds (i.e. funds set up in the UAE, the DIFC or the ADGM) to potential investors situated anywhere within the UAE. The Fund Protocol Rules of the DFSA Rulebook set out the DFSA’s requirements regarding how Fund Managers or Authorised Firms can register domestic funds for passporting. In the ADGM, the recently issued Fund Passporting Rules sets out the FSRA’s requirements. The SCA has also just recently circulated its fund passporting rules. In light of the upcoming FATF Mutual Evaluation of the UAE, the DFSA and the FSRA have initiated changes to its AML regime to ensure compliance with the 2012 FATF Recommendations. In October 2018 the DFSA implemented its amendments to the Anti-Money Laundering, Counter-Terrorist Financing and Sanctions Module of the DFSA Rulebook (‘AML Rules’) and the DIFC Regulatory Law 2004. In summary, the various changes related to clarifying the DFSA’s AML remit, the DFSA’s supervision of Designated Non-Financial Business Professionals and the implementation of significant amendments to the AML Rules to ensure compliance with the FATF’s 2012 Recommendations. The sections of the AML Rules updated include customer due diligence, record keeping, new technologies, wire transactions, reliance on third parties, internal controls and foreign branches and subsidiaries and higher risk countries. On 11 February 2019, the FSRA issued a consultation paper on its proposed revisions to the AML regime in the ADGM. As already discussed in greater detail in previous Al Tamimi updates, in November 2018 the DIFC introduced a new companies’ regime which included the issuance of a new Companies Law (DIFC Law No. 5 of 2018) which came into effect on 12 November 2018. The new companies’ regime aims to provide greater certainty and flexibility to companies by introducing the concept of private and public companies, where private companies are subject to less stringent requirements. Various other amendments were introduced including enhanced directors’ duties. An important point to note in respect of the new DIFC regime, is that DFSA regulated firms, are exempt from the new Ultimate Beneficial Owner regulations. Following this, the DFSA also introduced some enhancements to their funds’ regime. Some of the changes include: a new distinction between a public and private company as introduced by the Companies Law; removing the investor number-based criteria in the Exempt Fund and Qualified Investor Fund definitions; introducing Exchange-Traded Funds as a new specialist class of fund; making some changes relating to Property Funds; and introducing a new model for internal management of an Investment Company, where such a company can be internally managed by its licenced sole corporate director, subject to certain requirements. Following on from previous a guidance issued by the FSRA in 2017 regarding its regulatory treatment of initial coin offerings, on 25 June 2018 the FSRA issued its framework for the regulation of crypto asset activities in the ADGM. This included introducing a new Regulated Activity of ‘Operating a Crypto Asset Business’ which covers exchanges, custodians and other intermediaries engaged in crypto asset activities. In accordance with the ADGM’s guidance operating a Crypto Asset Business involves undertaking one or more Crypto Asset activities in or from the ADGM. Crypto Asset activities include dealing, managing, advising, arranging and marketing in relation to Accepted Crypto Assets (as further defined in the FSRA’s Rules) or operating a Crypto Asset Exchange or operating as a Crypto Asset Custodian. On 10 September 2018 the FSRA issued its framework for operators of financing or funding platforms for non-public companies, referred to as ‘Private Financing Platforms’. The new Regulated Activity of ‘Operating a Private Financing Platform’ is defined to capture a number of alternative financing arrangements including equity funding, private placement and invoice financing. Under the new framework the FSRA has also updated its Conduct of Business Rulebook to include rules applicable to Operating a Private Financing Platform. They have also issued detailed guidance covering the authorisation criteria for potential applicants and ongoing regulatory requirements of operators of Private Financing Platforms. Al Tamimi & Company’s Banking & Finance team regularly advises on financial services regulatory matters. For further information, please contact Sarah El Serafy (s.elserafy@tamimi.com) or Margaret Elder (m.elder@tamimi.com).